lovely claudia! fillet mingon is my favorite cut of steak. 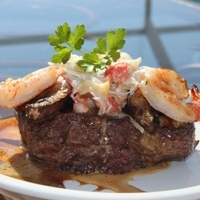 Love me some surf and turf`. This looks great, I might try it for Valentines day. hey claudia i would love to try this but cant seem to find the link below to get full recipe! !...is it because im on a mobile site? Truly an awesome meal, my wife loves this dish!!!! Oh shear heaven!!! Will try this SOON!!! I know this is going to be SO great!!! I cannot wait!!! Will add more review when I do try! Thank you so much for sharing!!! I like Italian Food anyway but this looks better than its supposed to be. All the right stuff that melds perfectly.